Noise. While we can’t avoid the range of decibels on this planet, there is much we can do to mitigate it for general comfort. Businesses across the nation often struggle with balancing the fun and excitement of their enterprise with the total volume present within the establishment. In fact, noise issues comprise the second most common complaint made by guests at restaurants. Many complaints focus around the lack of ability to carry a conversation, greatly impacting the quality of that food establishment. Property owners and franchisees will be responsible for finding a commercial drywall company to create effective solutions for noisy outcomes. AZ Drywall Finishing is proud to be your trusted team across many industries. Since 1999, our drywall contractors in Chicago have delivered quality results for each of our clients, including metal stud framing, installing wall boards, and drywall finishing. Our team has the experience and training to provide quality results for the sounds in your structure, including acoustical ceiling panels! Sound can prove to be a major nuisance if left unchecked, which is why today’s post will highlight how sound travels and how it can impact your business. If you’re ready to create peace in business or project, be sure to contact us now for an estimate! Sound is born through vibration, displacing energy from one location to another. Sounds are created when an object is vibrated, travelling through a medium to reach to the next material. Sound waves can travel through gaseous, liquid, and solid materials, losing strength and intensity as it travels to disperse the excess energy. Air, which includes any open space in the building. Lights, outlets, ducting, and other elements all provide air, which offers little resistance to sound transmission. Vibration, transferring through floors, walls, and other solid surfaces. Much of the sounds you hear above and below constitute sounds through structural vehicles. While you do not want to silence your establishment, taking measures to protect it from audible overloads can do much to enhance the quality of your space. Sudden impacts – Shocking noise disturbances can be hard to deal with. Spaces such as apartment complexes rely on acoustic measures to minimize the sudden emission of sound from neary. Dropped pots or pans, cell phones, or any similar events can prove to be disturbing at any hour. Acoustic ceilings and drywall installations can help to reduce the impact sudden noises have in your building. Privacy – Reinforcing your walls, floors, and ceilings from acoustic transmissions can help to increase the building’s privacy. Many businesses rely on quality drywall systems to ensure enough privacy for personal conversations. The same applies to break rooms, conference rooms, and restrooms. Any area that does not feature adequate privacy will impact the daily comfort level of your business. Comfort – Your employees, guests, and customers will all prefer to be comfortable during their time in your building. A lack of privacy from others, sudden noises, and excessively loud occurrences can all ruin the experience your building provides. Increasing customer comfort will always yield positive results for business owners! Long-term health – Being startled awake at 2am can prove to be very detrimental for your long-term health, and working in an industry with excessive decibels will eventually cause irreparable damage. Installing sound-blocking features in your structure will yield more healthful benefits over the years. 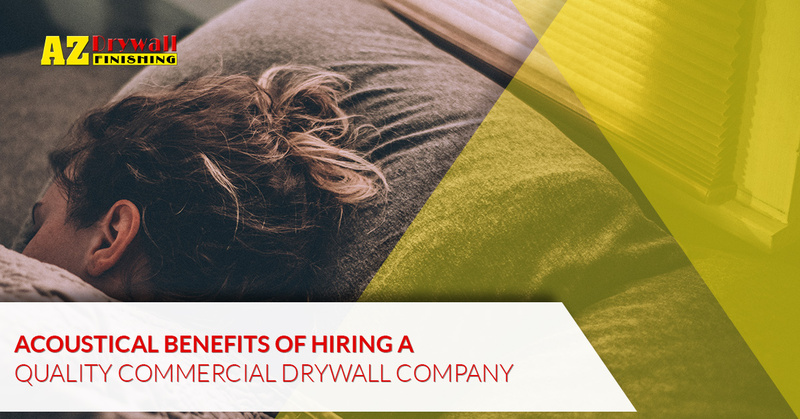 Businesses looking for sound-conscious outcomes for their new building or upgrade can benefit from hiring a commercial drywall company with a history of success. AZ Drywall Finishing is here to provide complete acoustic solutions for your building’s unique design. From restaurant owners to hospitals, apartment complexes, and more, acoustical drywall installation is proven to help increase the comfort level for guests and employees. We proudly provide drywall installation services, acoustic ceiling panels, and more to personalize the outcome to meet your goals and your budget. Our drywall contractors in Chicago are ready to get to work on your project. Contact us today to learn more about our drywall finishers and to receive your estimate!